Russia's Sports Ministry has been accused of directly orchestrating a doping programme running throughout the Sochi 2014 Winter Olympic Games in today's World Anti-Doping Agency (WADA) Independent Commission report which used a "Disappearing Positive Methodology". The report by Canada's Richard McLaren confirms and elaborates on the allegations of former Moscow Laboratory chief Grigory Rodchenkov. It revealed the system put in place by the Russian State extended far beyond the Sochi Games, including London 2012, the 2013 World Athletics Championships in Moscow and the 2015 World Swimming Championships in Kazan. The cover-up started after what the report describes as Russia's "very abysmal medal count" at the 2010 Winter Olympic Games in Vancouver, where the country finished 11th with three golds, five silvers and seven bronzes. At Sochi 2014, Russia topped the medal standings with 13 golds, 11 silvers and nine bronzes. The report showed the Sports Ministry "directed, controlled and oversaw" a "unique" method of sample manipulation at the Winter Olympic Games two years' ago, involving a sample-swapping method where they had been able to open and reseal tamper-proof bottles. McLaren also claimed it was "inconceivable" Russian Sports Minister Vitaly Mutko was not aware of the programme, while his deputy Yuri Nagornykh was found to have ordered the collection of clean urine samples. All evidence is verifiable and can be cross-corroborated by multiple sources, said McLaren, who added that his confidence in the report is "unwavering". The damning report is likely to intensify calls for a blanket ban on all Russian athletes competing at next month's Olympic Games in Rio de Janeiro. "Upon embarking on its investigation the IP (Independent Person) quickly found a wider means of concealing positive doping results than had been publically described for Sochi," the report's executive summary outlined. "The Sochi Laboratory urine sample-swapping scheme was a unique standalone approach to meet a special set of circumstances. "Behind this lay a greater systematic scheme operated by the Moscow Laboratory for false reporting of positive samples supported by what the IP termed the 'Disappearing Positive Methodology'. "What emerged from all the investigative sources was a simple but effective and efficient method for direction and control under the Deputy Minister of Sport to force the Laboratory to report any positive screen finding as a negative analytical result." McLaren said the investigation has established the findings set out in the report "beyond reasonable doubt". The report has been handed over to WADA President Craig Reedie, who has previously vowed to respond "firmly and effectively" should Rodchenkov’s allegations be proven. McLaren revealed the Investigation Commission had uncovered three key points. "Firstly, the Moscow Laboratory operated for the protection of doped Russian athletes within a state-directed, fair-safe system, which we described in the report as the 'Disappearing Positive Methodology'," he said in his opening remarks. "Secondly, the Sochi Laboratory operated a unique sample-swapping methodology to enable doped Russian athletes to compete at the Winter Olympic Games. 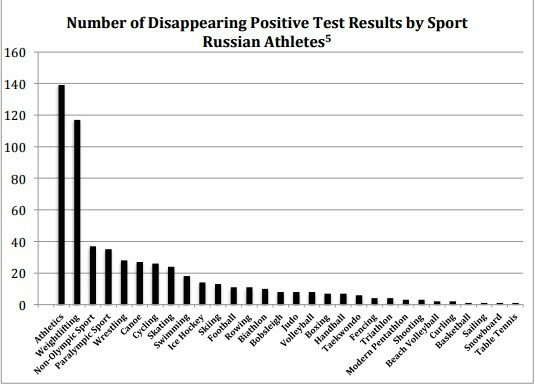 "Thirdly, the Russian Ministry of Sport directed, controlled and oversaw the manipulation of athletes' analytical results or sample-swapping, and the act of participation and assistance of the FSB (Russian Federal Security Service), CSP (Center of Sports Preparation of National Teams of Russia) and both Moscow and Sochi Laboratories." The FSB worked in a building next to the Sochi Laboratory, swapping positive urine samples for clean negative ones through a "mouse hole", adding table salt to bring the samples up to the correct weight. A key FSB agent, disguised as a sewage and plumbing contractor, had access to the Laboratory. However, in swapping urine samples, the FSB agents left miniscule tool marks on the "tamper-proof" bottles - found by the WADA investigarors using a microscope. Positive tests began disappearing in 2011 and Russia created a frozen urine storage bank ahead of Sochi 2014, the report states. A total of 8,000 samples held by the Moscow Laboratory, and dated prior to September 10, 2014, were destroyed. 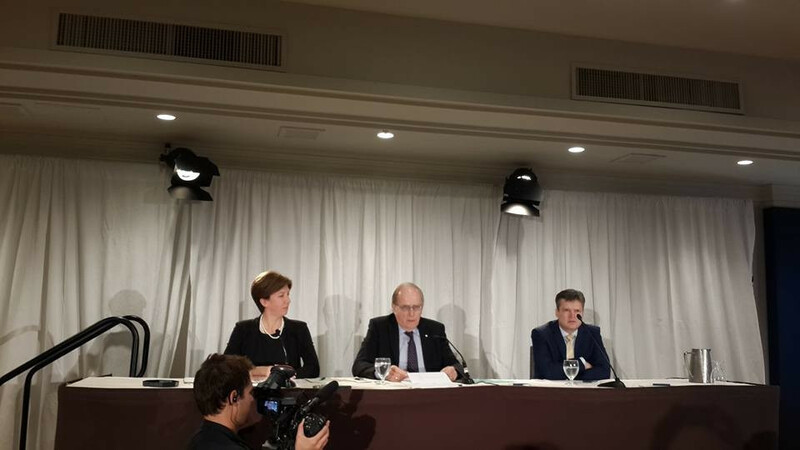 Paul Melia, chief executive of the Canadian Centre for Ethics in Sports (CCES), which along with the United States Anti-Doping Agency (USADA) called for a blanket ban on Russia, said he is "shocked" and "saddened" by the findings. "I can only imagine how betrayed the clean athletes of the world are feeling today in the face of this evidence," he told reporters in the aftermath. USADA chief executive Travis Tygart, who has previously lobbied for a full Russian ban at Rio 2016, has also given his reaction. "The McLaren Report has concluded, beyond a reasonable doubt, a mind-blowing level of corruption within both Russian sport and Government that goes right to the field of play...and most importantly, our hearts go out to athletes from all over the world who were robbed of their Olympic dreams," he said in a statement. "Looking forward, we must come together as an international community - comprised of those who truly believe in the spirit of Olympism - to ensure this unprecedented level of criminality never again threatens the sport we cherish." McLaren claimed the calls of the CCES and USADA for a complete ban on Russian competitors at Rio 2016, in a leaked draft letter, were based on "rampant speculation" about the findings. 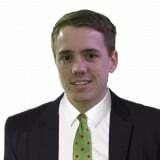 "I don't think it has any impact whatsoever on the report and I pay no attention to it," said the law professor. "I'm positive the report was not leaked. "What others did was all speculation." Russia has already been banned by the International Association of Athletics Federations due to doping exposed last year. An appeal will be heard tomorrow at the Lausanne-based Court of Arbitration for Sport with a verdict set to be reached by Thursday (July 21). You can read the full McLaren report here and look back on the day as it happened with our live blog here.